In conjunction with Augustana's 2016 undergraduate summer research program, AU student Jordan Bormann '17 spent 12 weeks this summer participating in research, shadowing physicians and scientists, and attending presentations during her work at Massachusetts General Hospital. This summer, AU students explored the Natural Sciences through cancer pathways, laser spectroscopy, and beer – yes, beer. For 12 weeks this summer, biology major Jordan Bormann ‘17 had the ultimate insider’s look at what it’s really like to be a physician and a researcher. The recipient of a research grant through the National Institutes of Health and Harvard Catalyst, Bormann spent the summer working at Boston’s famed Massachusetts General Hospital under Dr. Eric Klawiter, a neurologist specializing in multiple sclerosis. She participated in multiple sclerosis (MS) imaging research, shadowed physicians and residents over amazing-but-grueling 30-hour shifts, witnessed the compassion of a doctor delivering an MS diagnosis to a patient, and attended “Brain Cutting Presentations” and brain autopsies at Harvard Medical School. “[Interacting with] patients like these further motivated me to commit to a life of healing,” said Bormann, a native of Parkston, South Dakota. “Medicine’s ability to make advancements in the form of new procedures and medications that help patients such as the multiple sclerosis population provides me with enthusiasm for what lies ahead." "These experiences further piqued my curiosity surrounding medicine’s promise of a career allowing lifelong learning." "I would like to thank Dr. Klawiter, an Augustana alumnus from the Class of 2000, and his lab group and fellows for an incredible summer experience in Boston. This opportunity was truly an ‘Augie Advantage,'" Bormann said. Bormann is just one of nearly 70 Augustana students who gained invaluable hands-on experience and personal perspective this summer by participating in undergraduate research, internships, and volunteer opportunities organized through the University’s Natural Science Division and supported through agencies such as the National Science Foundation (NSF), the Biomedical Research Infrastructure Network (BRIN), the Experimental Program to Stimulate Competitive Research (EPSCoR), the Sanford Program for Undergraduate Research (SPUR), the Avera Genomics Institute, and more. By working alongside Augustana professors and with researchers at labs and centers throughout the U.S., students end up learning far more than they anticipate, University officials say. “The skills students learn in research are many and can be applied to every career that they might pursue after graduating from Augustana,” said Dr. Jenny Gubbels, an associate professor of biology at Augustana who also worked with students this summer on a research project related to understanding how ovarian cancer spreads through the body. 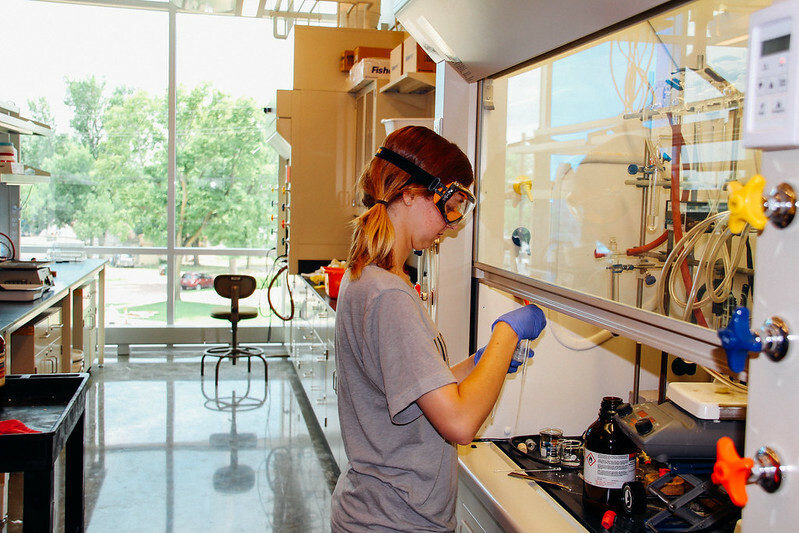 On campus, much of the summer research took place in the new Froiland Science Complex, Augustana’s new 125,000-square-foot science facility which will be officially dedicated on Friday, Sept. 23. Grandprey, a biology major, said the experience she gained through her summer research will be invaluable as she pursues veterinary school after Augustana. In another lab just down the hall, AU senior Dan Schmidtman (Sioux Falls) and Dr. Paul Egland, chair and associate professor of biology, researched the “Isolation of Native Microbes” in a project designed to provide a local brewing company with yeast strains from South Dakota to use in its brewing process. Learn more about this project. Across the globe in Africa, senior Natalie Walter, a native of Rochester, Minnesota, spent the summer volunteering at the Cape Coast University Hospital in Ghana and doing a project for the Public Health Program in Dodowa. Learn more about Walter’s experiences. Nick Antonson, Class of 2017, Beresford, South Dakota. Major: Biology/Secondary Education. Mentor/advisor: Steven Matzner. Funding source: EPSCoR. Paige Baker, Class of 2018, Luverne, Minnesota. Major: Biology/Psychology. Mentor/advisor: Patrick Ronan. Funding source: BRIN. Lucas Bartl, Class of 2018, Aberdeen, South Dakota. Major: Biology. Mentor/advisor: Seasson Vitiello. Funding source: BRIN. Research location: Augustana. Hugo Bethancourt, Class of 2017, Guatemala. Major: Physics/Math. Mentor/advisor: Nathan Grau. Funding source: NSF. Research location: Augustana. Christian Boechler, Class of 2018, Rapid City, South Dakota. Major: Biology/Chemistry. Mentor/advisor: Kyle Roux. Funding source: EPSCoR. Research location: Sanford Research. Jordan Bormann, Class of 2017, Parkston, South Dakota. Major: Biology. Mentor/advisor: Eric Klawiter. Funding source: NIH. Research location: Massachusetts General Hospital. Michael Brandt, Class of 2018, Rochester, Minnesota. Major: Biology. Funding source and location: Mayo Clinic. Brooklyn DeVries, Class of 2018, Sioux Falls. Major: Biochemistry. Mentor/advisor: Seasson Vitiello. Funding source: SPUR. Research location: Augustana. Kaitlyn Dorn, Class of 2017, Litchfield, Minnesota. Major: Biology. Mentor/advisor: Jianning Tao. Funding source: BRIN. Research location: Sanford Research. Alexandra Fairchild, Class of 2018, Watertown, South Dakota. Major: Biology/German. Mentor/advisor: Peter Vitiello. Tyler Field, Class of 2017, Maple Grove, Minnesota. Major: Exercise Science. Mentor/advisor: Brittany Gorres-Martens. Kaitlynn Foss, Class of 2017, Sioux Falls. Major: Biology. Mentor/advisor: Mark Larson. Funding source: EPSCoR. Research location: Augustana. Andrew Gardner, Class of 2017, White Bear Lake, Minnesota. Major: Physics/German/Math. Mentor/advisor: Lindsay Erickson. Funding source: South Dakota Space Grant. Brianna Grandprey, Class of 2017, Windom, Minnesota. Major: Biology. Mentor/advisor: Jennifer Gubbels. Geoffrey Gray-Lobe, Class of 2017, Vermillion, South Dakota. Major: Biology/Math. Mentor/advisor: Etienne Gnimpieba. Funding source: BRIN/Bioinformatics core. Research location: USD. Luke Hurley, Class of 2018, Canton, South Dakota. Major: Biology/Business Administration. Mentor/advisor: Mark Larson. Stephanie Jahnz, Class of 2019, Lewisville, Minnesota. Major: Biochemistry. Mentor/advisor: Jennifer Gubbels. Ryan Johnson, Class of 2019, Lincoln, Nebraska. Funding source: BRIN Biotech Fellow. Research location: POET. Kyle Kettler, Class of 2018, Andover, Minnesota. Major: Biochemistry/Philosophy. Mentor/advisor: Seven Matzner. John Klecker, Class of 2017, Sioux Falls. Major: Biochemistry/Classics. Mentor/advisor: Margaret Slupska. Chase Klingaman, Class of 2018, Mitchell, South Dakota. Major: Biochemistry/Modern Foreign Languages. Mentor/advisor: Jared Mays. Kayla Knutson, Class of 2018, Hurley, South Dakota. Major: Biology/Spanish. Mentor/advisor: Jill Wiemer. Jacob Kunkel, Class of 2017, Albert Lea, Minnesota. Martina LaVallie, Class of 2016, Sioux Falls. Research location: University of Nebraska, Lincoln. Bereket Mamo, Class of 2017, Ethiopia. Major: Biology/Physics/Math. Mentor/advisor: Drew Alton. Abby Martin, Class of 2018, North Prairie, Wisconsin. Major: Math. Mentor/advisor: Lindsay Erickson. Funding source: South Dakota Space Grant and the AU Research and Artist Fund. Research location: Augustana. Daniel Matzner, Class of 2018, Sioux Falls. Major: Biology. Mentor/advisor: Kristi Egland. Funding source: SPUR. Research location: Sanford Research. Deeksha Mohan, Class of 2017, India. Major: Biology. Mentor/advisor: Cecelia Miles. Joseph Napierala, Class of 2017, Alta, Iowa. Major: Physics/Biology. Mentor/advisor: Eric Wells. Funding source: South Dakota Space Grant. Research location: Augustana. Skyy Pineda, Class of 2018, Millbrae, California. Major: Biochemistry. Mentor/advisor: Andrew Klose. Caden Quintanilla, Class of 2018, Sioux Falls. Joshua Reider, Class of 2018, Crooks, South Dakota. Elizabeth Renner, Class of 2017, Crooks, South Dakota. Reed Ritterbusch, Class of 2018, Sheridan, Wyoming. Jessica Roetman, Class of 2017, Rock Rapids, Iowa. Major: Biology. Mentor/advisor: Dr. Khazaie. Funding source: NSF/REU. Research location: Mayo Clinic. Alison Rollag, Class of 2018, Sioux Falls. Major: Biology/Psychology. Mentor/advisor: Patrick Ronan. Funding source: BRIN. Research location: USD. Daniel Schmidtman, Class of 2017, Sioux Falls. Major: Biology/Spanish. Mentor/advisor: Paul Egland. Funding source: BRIN Biotech Fellow. Research location: Augustana and Fernson Brewing. Nawshin Sharif, Class of 2019, Maple Grove, Minnesota. Research location: University of Minnesota. Taylor Siewert, Class of 2017, Lake City, Minnesota. Major: Biology/Psychology. Mentor/advisor: Cecelia Miles. Katelyn Stevens, Class of 2019, Elk River, Minnesota. Major: Biochemistry. Mentor/advisor: Jetty Duffy-Matzner. Selamawit Tegegn, Class of 2017, Ethiopia. Major: Engineering Physics. Mentor/advisor: Eric Wells. Zachary Tuschen, Class of 2017, Sioux Falls. Major: Biology. Mentor/advisor: Keith Miskimins. Amber Veldman, Class of 2018, Hudson, South Dakota. Major: Biochemistry. Mentor/advisor: Mark Larson. Ellen Voigt, Class of 2017, Rapid City. Major: Biochemistry. Mentor/advisor: Pradip De. Funding source: Avera Genomics Institute. Research location: Avera Health. Matthew Wagner, Class of 2018, Sioux Falls. Major: Biochemistry. Mentor/advisor: Jared Mays. Natalie Walter, Class of 2017, Rochester, Minnesota. Funding source: Ghana Health Program. Research location: Ghana. John White, Class of 2018, Ralston, Nebraska. Major: Physics/Computer Science. Mentor/advisor: Nathan Grau. Geyang Zhou, Class of 2018, China. Major: Engineering Physics. Mentor/advisor: Nathan Grau. Blake Ziegler, Class of 2018, Luverne, Minnesota. Major: Biology. Mentor/advisor: Kevin Frances. David Hanson, Class of 2019, inventory and journal writing internship, Smithsonian Natural History Museum, Washington, D.C.